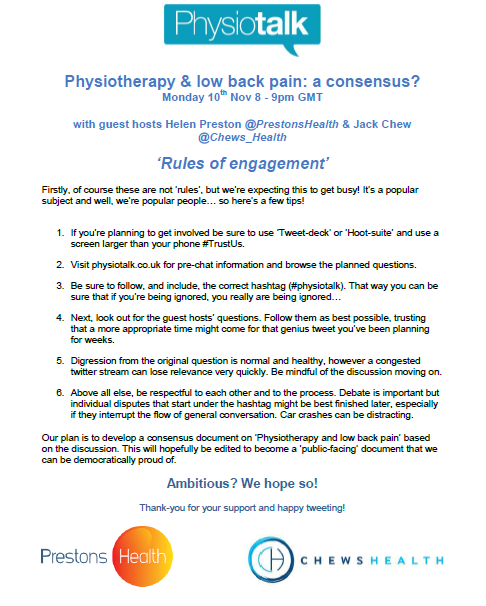 The assessment and management of low back pain is an area of diverse clinical thinking and practice within physiotherapy and on Monday 10th November at 8pm(GMT) #physiotalk will be focusing on this with Helen Preston (@PrestonsHealth) and Jack Chew (@Chews_Health). Low back pain is known to affect the majority of people at some point in their adult lives; therefore it is a patient problem that most physiotherapists have encountered in a variety of settings. This #physiotalk will discuss assessment, treatment and management of acute, persistent and recurrent low back pain with an emphasis on clinical reasoning. Clinical strategies in practice are varied, therefore this diversity in thinking will be discussed, with a view to determining whether a ‘best practice consensus’ can be formed. We’ll also touch on iatrogenesis of back pain, what it is, how it happens (often inadvertently) on a regular basis in practice and in society, and how healthcare professionals can avoid this. Finally, we will be covering the opportunities to provide simple but effective evidence based messages to society, patients and healthcare professionals about low back pain, and the range of methods we can use to do this, exploring what pertinent messages should be promoted in the media for maximal public reach. Wow – that was a busy chat with so many enthusiastic, passionate physiotherapists, student and other therapists taking part. Here’s the link to the transcript for all the tweets on the night. We had a few glitches with twitter on the night so do leave any comments about the chat under this blog post. Jack Chew: I’m a Chartered Physiotherapist working part time as an NHS MSK clinical specialist in leafy East Cheshire and part time as adult service clinical lead for Chews Health, a company that I co-founded in 2012. I am possibly best known as the ever-questioning voice of ‘The Physio Matters Podcast’ in which myself and an elite team of wannabe journalists try to offer a critical ear to well… physio matters. I am a passionate advocate for the instigation of change. On a frontline clinical level, through education and active rehabilitation, and from a journalistic standpoint, through altering perception and challenging beliefs. Low back pain is an increasing burden on society despite a growing and varied evidence base. Can we develop a balanced consensus on LBP and if possible, how can we best disseminate this to the public?